We live in the football era of specialization: Slot receiver. Third down back. Move tight end. Pass rush defensive end. Nickel back. In the box safety. But there was a time when its best players played more than one role. Sammy Baugh was both a great passer and ball hawking safety. Chuck Bednarik played on both sides of the trench. 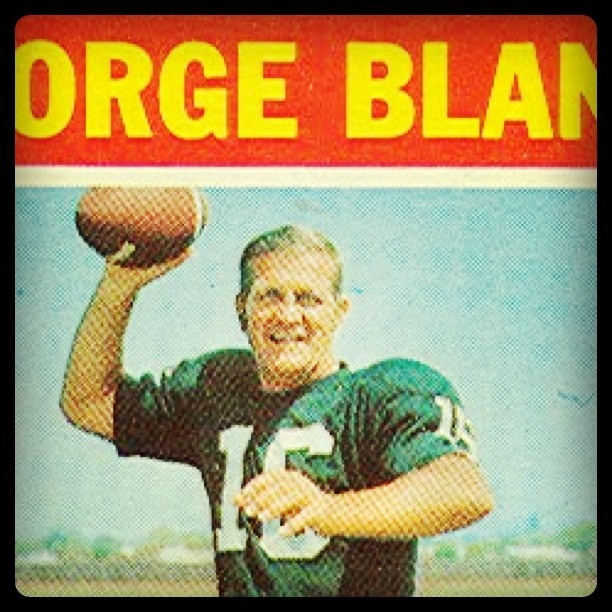 George Blanda used his arm to lead his teams down the field and his foot to finished the drive. They transcended a single position and were best known as “football players.” Believe it or not, we still have football players in the NFL. A lot of them in the past 10 years have been on the New England Patriots. Troy Brown was both a reliable slot receiver and didn’t fair too badly as a nickel defender. Linebacker Mike Vrabel also had his share of touchdown passes as a tight end. Julian Edelman is an able receiver who did a great job of breaking down DeSean Jackson in the open field two weeks ago as defensive back. Hell, Doug Flutie made the first dropkick in decades when he was at the end of his career in New England. Technically one could make the claim that these were specialty players trained to play a specialty position on the opposite side of the ball. That may be true, but I believe a truer way of labeling this behavior is that these players understand the game of football and it is why their abilities and talents translated to other positions even if the role was limited in scope. Another great example from New England is Tedy Bruschi, a linebacker that some scouts didn’t believe had a prototypical fit at the position in the NFL. However, New England realized Bruschi was a “football player,” and they adjusted their system to maximize his talents. There’s a lot of truth in the claim from individual NFL players that the league treats them like interchangeable parts. The specialization of offensive, defensive, and special team systems are like machines.Playbooks with their various formations look like schematic drawings. With names for positions like cornerback, gunner, slot receiver, and 3-technnique, it makes perfect sense that players are on some level dehumanized into parts. Maybe this is why the more I look at the Patriots during the last 10-12 years I value how this team is frequently the antithesis of most NFL trends. They aren’t obsessed with prototypes; they want football players. If they don’t have good football players at a position the coaching staff works around it. Consider the Patriots wide receiving corps. Beyond Wes Welker they lack a quality starter at the position, but they don’t try to make the offense run through its perimeter receiving game. Before New England had Rob Gronkowski and Aaron Hernandez the organization couldn’t find a reliable pass-catching tight end that could also block so they relied on Welker and Randy Moss. And before Welker and Moss, the Patriots ran its offense through Corey Dillon. Through out these three eras of offense, the two constants have been Bill Belichick and Tom Brady. Think about how rare it is for a team with the same coach and quarterback to have this kind of success with these variations in its offensive philosophy. The Steelers offense of the`70s and `80s were essentially the same, they just opened the passing game a little more once Bradshaw was ready. The Bills and Cowboys of the late `80s and much of the `90s had the same basic offensive philosophy until those key players moved on. The 49ers of the Montana and Young dynasty ran a West Coast offense. These offenses were point manufacturing machines and the coaches were industrial engineers. Belichick might also be an engineer, but the way he drastically alters the machine to create points makes me think of him more as an artist than a technician or scientist. There’s also great irony that in the public eye Belichick is the most stoic technician of pro coaches but he might value his team as a collection of individual football players more than any leader in the NFL. It’s obvious that the Patriots find out what their individual players are good at and fit the system to complement the player rather than try to fit the player into the system. One might not initially agree with this thought when Chad Ochocinco is still struggling to grasp the Patriots offense. However, consider the fact that the Cincinnati Bengals allowed Ochocinco and Terrell Owens to wreck the passing game with poorly run routes, missed hot reads, and poor execution as pass receivers on a weekly basis as starters. Batman and Robin are physical prototypes at the position and the Bengals organization demonstrated that the players were expected to fit the system rather than fitting the system to the players. The Bengals epitomize a manufacturing facility that blames its parts as faulty for poor production but doesn’t consider the design of the overall machine. Players are cogs in an industrialized, automated process. The Patriots coaching staff view its players as craftsmen and figure out how to maximize the output of these individuals. Fortunately, the Patriots aren’t the only team with football players. The New Orleans Saints lack a prototypical primary receiving threat at the wide receiver position. Marques Colston is a fine player, but he lacks the versatility to stretch the field or break a play open after the catch. Lance Moore is a fine slot receiver and Robert Meachem and Devery Henderson are a perfect contrast to Colston in terms of skills and deficits.It’s Darren Sproles and Jimmy Graham that tie this offense together. Both could be technically seen as specialty players, but Sproles is both a capable running back and a slot receiver. Graham is a slightly bigger, faster, and more powerful Marques Colston capable of blocking at the line of scrimmage as well as working the perimeter as a wide receiver. Reggie Bush was also a football player. Mohamed Sanu of Rutgers isn’t a refined receiver, but his raw skills as a pass catcher are among the best in college football. Like Percy Harvin, Randall Cobb, and Hines Ward, he’s a “football player.” Photo by West Point Public Affairs. Percy Harvin and Randall Cobb are football players. Both players can return kicks, play all three receiver positions effectively, and if needed, carry the ball between the tackles like running backs. Peyton Hillis could start in the NFL as a fullback, halfback, tight end or H-back. So could Cincinnati Bengal Brian Leonard. Mohamed Sanu is best labeled a football player. The Rutgers wide receiver/Wildcat trigger man is a versatile offensive weapon. At 6-1, 215 Sanu has the size to run between the tackles. He has the athleticism to adjust well to the football in the air as a receiver in single coverage. And he has the initial quickness, power, and balance to gain yardage after contact. What Sanu does best is catch the football. Against North Carolina in September of this year, Sanu had five receptions that I would consider catches with a high degree of difficulty. Four of those five catches were leaping one-handed grabs where Sanu had to extend an arm away from his body for the ball while he was airborne and either with his back to the quarterback or adjusting to a pass thrown behind him. He made these types of one-handed plays with either hand and in traffic. The question marks with Sanu’s game are his top-end speed and how effectively he can develop his route and release skills to play receiver at the NFL level. At Rutgers, Sanu is often used as a slot receiver on seams, slants, look-ins, screens, and crosses. His experience against press coverage is limited and the frequency he is used on pro style intermediate and deep routes is limited as well. However, what I see in Sanu is a football player. He understands the game, he just needs a more specialized understanding of the receiver position. If he lands on a team with the mentality like the Patriots, Steelers, or Saints he has a great chance to succeed in the NFL. Great article. As a long time Pats fan I would be thrilled to have this kid on the squad. Looks like just the kid Belichick wants. Oh, and don’t forget about Hernandez at TE, WR and now RB this post season! As if Defenses didn’t have enough to worry about with him.